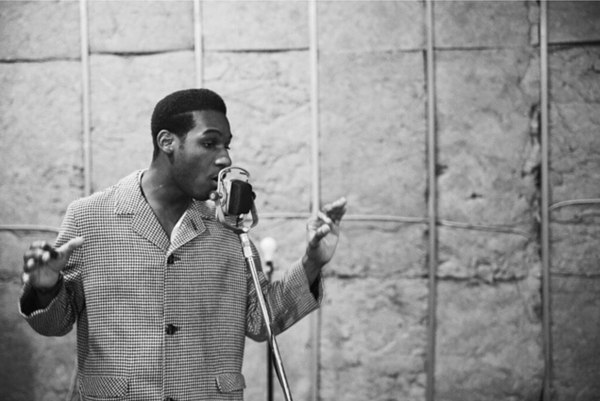 When I first heard Leon Bridges my immediate reaction was that Sam Cooke had come back from the dead. I’m serious. The black-and-white soul sound sent me back to that magical moment when I first explored the inception of Soul music: the early 1960s sounds of names like Cooke, Wilson, and King. Then, I shook myself out of this initial daze. Sam Cooke – A man widely regarded as one of the finest vocalists of all time!?! How could I make such a wild comparison? But, as I took more time to listen to some tracks off Bridges’ soon-to-be-released debut album Coming Home, I realized that the comparison, while lofty, was not ridiculous. Bridges’ voice “sends me” to the soul-saturated sounds of the early 60s, and, while it may not in full bring back the mainstream popularity of slow horns and vocal harmonies, the music is certainly bridging that sounds to the ears of soul ingénues. Bridges, who was born in Atlanta and now resides in Fort Worth, reached viral success with his song “Coming Home,” which caught the ears of several and helped him secure a record deal with Columbia Records. The overflowing bucket of talent that Bridges exuded did not stay hidden for long. With the help of Austin Jenkins and Joshua Block from White Denim, Bridges recorded his first few tracks – employing the aid of vocalists and bands that helped complement the 60s sound. His renown and success will only skyrocket with his release in June. Coming Home” immediately takes on the feel of “You Send Me” with tastes of “A Change is Gonna Come,” and Bridges soft croon, a smoother Hozier (to make a modern comparison), has a rich Gospel feel to it that is just the right kind of sweet, not mawkish and not overpowering – it’s a voice that you can sink into, like silky gelato. The song itself is classic early Motown. It is carried by a bluesy piano and guitar mixed with traditional percussion. It is not difficult to imagine Sam Cooke or Otis Redding singing this song, and Bridges’ voice is not really a step down; heck, I am almost willing to go so far to exclaim that Bridges parallels the singers in a sense. Not too shabby. From the slower “Coming Home” to the early Marvin Gaye-esque “Better Man.” The song features a literal doo-wop backdrop that is combined with a sweet horn section. It is almost minimalistic in its approach, and perhaps that is what I like so much about Bridges and his throwback tunes. In a musical world dominated by heavy electronics where artist after artist attempts to impress with eclectic sounds and instrumentation, Bridges takes a more traditional approach, fitting a wonderful track into a little more than two minutes. Bridges is an artist worth tracking. You can follow him on Facebook, Twitter, or his Website. modt recent and preceding technologies, it’s remarkable article.